Orleans hotels. This page lists hotel accommodation in Orleans and/or closeby. If you are travelling for business or pleasure please choose from our selection of hotels in Orleans Loire Valley France. Set in a beautiful district of Orleans, the apparthotel Sejour et Affaires Jeanne d'Arc enjoys a unique emplacement right amidst the historic part of the city. The residence offers you the conviviality of a warm and functional atmosphere to relax, work, meet friends, family or colleagues. The studios and apartments are also tastefully appointed and well-equipped, offering you all the essentials for a great stay. The apparthotel Sejour et Affaires Jeanne d'Arcoasting boasts an ideal situation, just few steps away from the theater, restaurants, the train station and the Place du Martroi. Discover the beauty of Orleans : the historic centre, the banks of the Loire River, as well as the jazz festival in the beginning of July, one of the biggest in France. Located in central Orleans, in an area surrounded by shops and restaurants, this hotel is decorated in an Art Deco style and offers well-equipped rooms with free Wi-Fi internet access. Best Western Hotel d'Arc is entirely non-smoking and features light and spacious guestrooms stylish and elegantly furnished. Enjoy a generous breakfast at the Best Western before setting off to explore the nearby sites of Orleans, such as La Tour Saint-Paul and Le Pont George V. The friendly and attentive staff at the Best Western Hotel d'Arc will be happy to help you organise your stay in Orleans 24-hours a day. 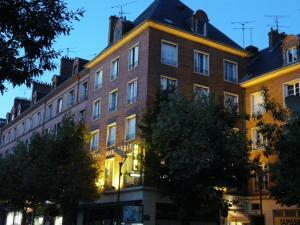 Along the banks of the River Loire, close to the city centre, you will find the Escale Oceania Orleans. The hotel is an attractive building where you will easily combine business and leisure. Enjoy comfortable rooms, private lounges, room service and the free private car park. In the heart of the city in a quiet quarter, close to the banks of the Loire, you can expect a warm welcome at Hotel Marguerite. This entirely non-smoking hotel, which appears in the Michelin Guide, offers comfortable and affordable accommodation. All of the spacious, renovated rooms are equipped with modern en suite facilities to provide you with a relaxing living space. Wi-Fi internet access is also available and is free of charge. The central location of Hotel Marguerite puts you just a 10-minute walk from the railway station and the cathedral and within close proximity to the city's various historical and cultural sites. The 3-star hotel is well located in Orleans, within walking distance of the Loire river and 10 minutes away from the railway station and the city centre. Hotel des Cedres offers a cosy setting, quiet and comfortable rooms, a veranda as well as a garden.The recently refurbished rooms are equipped with new beds and flat screen TVs. Benefit from a free Wi-Fi Internet access to keep in touch with your friends, colleagues or family. Moreover, the hotel is an ideal place to stay to discover Orleans and all the attractions of the area, such as the castles. Hotel Saint-Aignan is 3 minutes walk from the SNCF train station, and only 5 minutes from the city centre. It offers free Wi-Fi. Rooms are spacious and individually decorated. They come fully equipped with TV and private bathroom. Buffet breakfast is served daily in the cosy dining room. Hotel Saint-Aignan is a great base for exploring the Loire Valley and the nearby vineyards of Sancerre. The Grand Hotel is located in central Orleans, on a peaceful street near many shops and a few minutes from the Cathedral Saint Croix and the Museum of Fine Art. The hotel offers 33 comfortable rooms all equipped with private bathrooms, direct dial telephones, satellite TV and free Wi-Fi internet access. Rooms are entirely soundproofed. The area surrounding the Grand Hotel is full of restaurants and bars, and the train station is only 300 metres away. The Grand Hotel makes an ideal starting point for excursions to the Loire Valley, with its verdant parks, castles and cathedrals. Located in the heart of the city with views of the Loire River, the hotel offers 111 soundproofed and air-conditioned rooms. Benefit from an easy access from the quays. Close to the junction of major national highways, Mercure Orleans Centre is situated 800 metres away from the Cathedral and 3 km from the Science Museum. The hotel features a private car park (at an additional cost), a terrace and a swimming pool. Quality Hotel Orleans Centre is a traditional property set in a pedestrianised area in central Orleans. It offers comfortable en suite accomodation. Included in the price of the room is breakfast, a welcome drink, a lunch box and 1-hour free internet access on the hotel's public computer. Tourist attractions such as Joan of Arc's house and the Sainte-Croix Cathedral are easily reached on foot from the My Hotel. The Orleans exhibition centre is just 5 km away from the Quality Hotel. Featuring a heated indoor swimming pool, free wired internet and free private on-site parking, the Citea Orleans provides comfortable accommodation near Orleans city centre. The Citea Orleans features air-conditioned studios and apartments. All of them are spacious, modern and fully equipped. They provide a cosy living space for 1 - 4 guests. Situated a few minutes by tram from the city centre, the Citea provides easy access to the main sites and attractions. Stroll along the banks of the Loire, enjoy a delicious meal in a local restaurant and discover this city's rich cultural history.